CALGARY — It was déjà vu all over again for John Swales in the Working Cow Horse Classic at the Calgary Stampede on Friday. “Did I? I don’t remember,” Swales said with typical cowboy modesty. (He also has no idea how many Stampede buckles he has.) The man from Millarville — the National Reined Cow Horse Association’s World’s Greatest Horseman in 2017 — did have more to say on how he approached competing on two mounts in the finals. Chics Made Me Do It — owned by Bev and Laura MacMillan of Okotoks, Alberta. — and Swales took the Champion title (along with $4,620 and a Stampede belt buckle) for a two-round aggregates score of 578. On Friday, the duo posted a 287 (143 on rein work and 144 on cow work), enough to edge out Swales’ ride on Metal Hickory 014, owned by Springhaven Ranches, also in Okotoks. The Reserve Champion win (with $3,850 and a Stampede buckle) came for their aggregate total of 576. 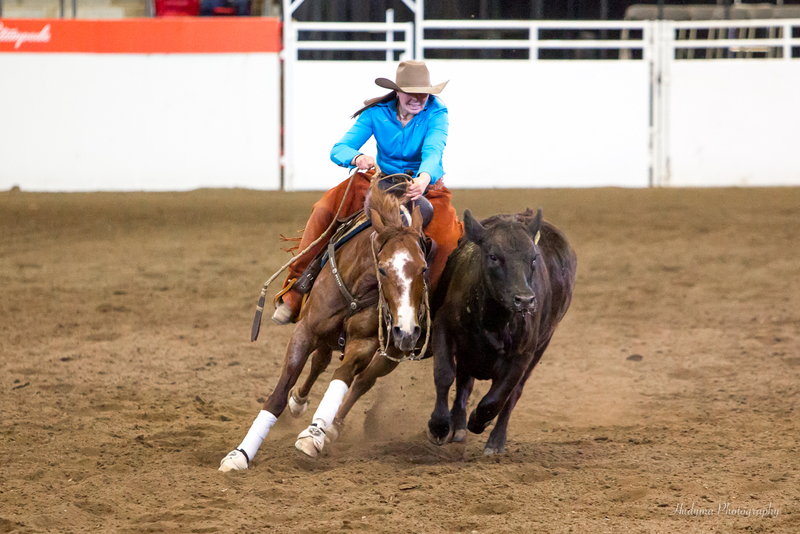 In the Working Cow Horse Classic, horse-and-rider teams are judged on their authority, discipline and precision in reined work and cow work (also called fence work). This year’s final ran on the No. 2 pattern: the reined portion featured a predetermined series of moves that included large circles at fast speed, a small circle at slow speed, spins (also called turnarounds) and sliding stops. In the cow-work portion, the team first boxed a head of cattle, then maneuvered it along the fence (the side of the arena), heading it off and turning it both ways, before circling it once in each direction, preferably in the centre of the arena. But the winner’s circle wasn’t reserved for veterans. 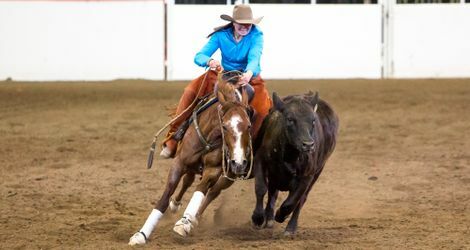 Eighteen-year-old Sonya Distefano of Millarville and her horse Reys Stylish Bell were named Champion in her first Stampede outing. After receiving her belt buckle and $2,670 for the win in Non-Pro Bridle, a visibly moved Distefano gave her horse a long hug in the cool-down area. In the event’s final class, Cody McArthur blasted into the Champion spot in Open Bridle on Coasting the Stars, owned by his wife, Farrah. Coming into the second go with a 292.5, McArthur and the six-year-old gelding sealed the deal by posting a 288.5 (145.5 in rein work, 143 in cow work) in the final run of the competition, earning a cheque for $4,350. Geoff Hoar, in his second ride of the night, earned Reserve Champion and $3,625 for his work with Deal Gold, owned by Margaret Wagman of Calgary. They posted an aggregate score of 576 after laying down a 143 in rein work and 145.5 in cow work. The McArthurs have worked with Coasting the Stars since Cody came across the then two-year-old palomino in Idaho. McArthur, who has won the Hackamore class previously and picked up a Reserve in the event before, ended his ride by leaning over and giving the cow a few good pats on the back while working the animal in the ring. For full results from the Calgary Stampede’s Working Cow Horse Classic, visit ag.calgarystampede.com/results.